Once again, all that remains of this Liliw Films International production is the poster for its debut at the 1982 Metro Manila Film Festival. Pablo S. Gomez (screenplay): Unbelievably prolific komiks writer with over 200 “nobelas” to his name. As with most komik creators (Mars “Darna” Ravelo, Carlos J. “Panday” Caparas), he also dabbled in screenplays, and wrote much of Fernando Poe Jr’s output from the late Seventies and Eighties. Berting Labra: Former member of the “Lo’ Waist Gang” alongside Fernando Poe Jr, an iconic group of Young Turks defined by their hugely successful string of action-comedies in the late 50s. The late FPJ became the most famous actor ever in the Philippines; Berting was more of a versatile supporting actor with roles in comedies, goon actioners, drama, you name it. Pia Moran: Flash-in-the-pan Filipino starlet with a handful of roles to her name before fading into obscurity. Dencio Padilla: Another prolific actor, primarily in comedies, who starred alongside Weng Weng in D’Wild Wild Weng. Beth Sandoval: “Irma” in For Y’ur Height Only and in two of Eddie Nicart’s other films, the western Zigomar (1984) and Calibre .357 (1985), she has since passed away. Bonnie “Mong” De Jesus: Six foot nine pro-basketball player who starred in Carlo J. Caparas’ 1979 basketball comedy Mong. 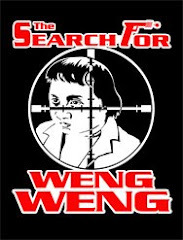 Playing the ying to Weng Weng’s yang, the awkward giant passed away in the early 80s. 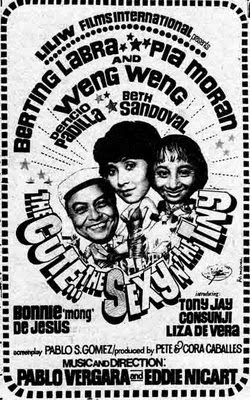 Dolphy remembers Weng Weng making a cameo in a kung fu film for director Luis San Juan immediately prior to his cameo in The Quick Brown Fox (1980).